The year 2018 saw a mix of conflict and cooperation among the three global economic powers, the United States, China, and European Union. During his first year in office Donald Trump eschewed confrontational trade policies over which corporate America is divided in favor of a domestic policy agenda designed to effect a massive upward redistribution of wealth, including the lowest corporate tax rate since 1939 alongside a host of business-friendly regulatory policies. Only in 2018 did he turn his attention to trade. Emboldened by a surging economy, starting in March, 2018 he enacted a series of tariffs, export controls, restrictions on foreign investment, and sanctions. However, in July the United States and EU declared a ceasefire, with both sides agreeing not to impose additional tariffs pending further negotiations. In September, the United States, Mexico, and Canada agreed on (but have not yet ratified) a renegotiated NAFTA (re-named the USMCA); a revised U.S.-South Korea free trade agreement (KORUS) was also signed. Negotiations on a transatlantic trade agreement are set to resume in 2019, but they will be contentious. The Trump administration wants to open up European agriculture to U.S. farmers and is threatening to impose tariffs on European auto exports if it does not. But auto tariffs would generate significant domestic opposition. The threat might not be credible and in any case Europe is unlikely to make significant concessions with respect to agriculture. Yet, bilateral discussions between Trump and Xi Jinping on the sidelines of the G-20 conference in Buenos Aires in December and between mid-level trade negotiators in Beijing in early January resulted in concessions by both sides. In December, Trump agreed to refrain from enacting further tariffs on China until March 1, pending further discussions. China responded in January by recommencing purchases of U.S. soybeans, dropping retaliatory measures against U.S. auto exports, resuming crude oil imports, and pledging dialogue on structural reforms with respect to intellectual property, subsidies, and FDI. These conciliatory steps reflect the recognition in Washington and Beijing that their financial markets and economies are acutely vulnerable to protectionist policies and rhetoric, a lesson that resonated especially with Donald Trump, reeling from Republican mid-term election losses and contemplating the 2020 presidential election amid growing economic turbulence. In its January, 2019 Global Economic Prospects Report entitled Darkening Skies the World Bank warns that “storm clouds are brewing over the world economy.” China’s economy is slowing, with official GDP growth projected to fall to 6.2% in the fourth quarter of 2018 amid steep declines in FDI, fixed asset investment, retail sales, industrial production, and profits. China is experiencing significant overcapacity, resulting in declining global material prices and already high and seemingly unstable levels of debt. Chinese equities declined by more than 25% during 2018. It’s FDI in Europe and North America is falling precipitously as a result of restrictions imposed by Washington and Brussels. The situation for Europe is no less precarious. Slowing growth in China will hit not only the rest of Asia but also Germany, which experienced negative growth (and declining exports) during the third quarter of 2018. German business confidence has plummeted. Although the IMF anticipates 1.9% growth for 2019, the EU faces tremendous economic and political headwinds. The ECB has slowed its asset purchases and plans to phase out its stimulus program and raise interest rates by the end of the year. Emmanuel Macron’s neoliberal project has been derailed by the “yellow vest” protests. Italy is mired in stagnation and debt. Regardless of the form that it eventually takes, the Brexit will do significant harm to both the UK and Europe. It will not open up a path to greater independence and unity in the EU or within the Eurozone, now crippled by seemingly permanent crisis of austerity under German leadership. The Franco-German entente is on its deathbed. Germany has rebuffed Emmanuel Macron’s pleas for a more expansive fiscal policy; France and Germany are deeply divided over trade negotiations with the United States. In December German automobile executives carried out private negotiations with U.S. Trade Representative Robert Lighthizer in the White House, making new commitments to the U.S. market and raising eyebrows in Brussels and Paris even as the administration downgraded the EU’s diplomatic status, apparently without even informing it. Notwithstanding torrents of bold and indignant rhetoric, with the partial exception of Nordstream 2 the EU can do little against U.S. extraterritorial sanctions that cause significant economic as well as political damage. European Parliamentary elections in May will almost certainly bring further gains to populist and euroskeptic forces. The prognosis for the U.S. economy is more mixed, with projected 3% growth for 2019, but even so there are signs of fragility. The recovery that started in 2009 cannot last indefinitely, especially if the Federal Reserve continues to increase interest rates and the fiscal stimulus resulting from the $1.5 billion tax cuts-- but also producing a ballooning budget deficit and raising the national debt to $22 trillion—diminishes. The U.S. government shutdown is also beginning to take its toll on the economy. While the United States and China will certainly not resolve their underlying conflicts before the March 1 deadline that Trump has imposed, both sides have strong incentives to preserve the current truce. However, many contentious issues remain, above all the transfer of technology with economic but also massive military implications. 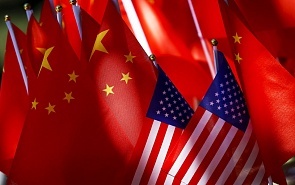 As it becomes more aware of China’s growing economic and military ascent, corporate America appears to be moving gradually towards the more hawkish position already staked out by the Office of the U.S. Trade Representative, the Pentagon, and both parties in Congress. U.S. multinational corporations will not easily relinquish their tenuous primacy within an Asian market that is projected to account for more than 50% of global GDP by 2050. The year 2019 might also see the further unfolding of the trend towards global bifurcation. Many U.S. firms are gradually shifting their supply chains out of China to other Asian countries, or contemplating this step. The United States is also placing more pressure on its central and eastern European NATO allies to support its containment strategy. The EU has begun to restrict Chinese acquisitions of European companies in strategic sectors. The USMCA explicitly prevents its members from signing a free trade agreement with a “non- market economy” (ie. China). Canada’s detention of the CFO of Huawei at the behest of Washington, followed by the arrest of a Huawei executive in Poland on charges of espionage, provide further evidence of this trend. A comprehensive trade war in 2019 is unlikely, but the U.S.-China rivalry is in its infancy.